292 people in our community are currently praying with you. O Lord our God, good and merciful, I acknowledge all my sins which I have committed every day of my life, in thought, word and deed; in body and soul alike. I am heartily sorry that I have ever offended you, and I sincerely repent; with tears I humbly pray you, O Lord: of your mercy forgive me for all my past transgressions and absolve me from them. I firmly resolve, with the help of Your Grace, to amend my way of life and to sin no more; that I may walk in the way of the righteous and offer praise and glory to the Name of the Father, Son, and Holy Spirit. "The right hand of the Lord has triumphed! the right hand of the Lord is exalted! the right hand of the Lord has triumphed!" 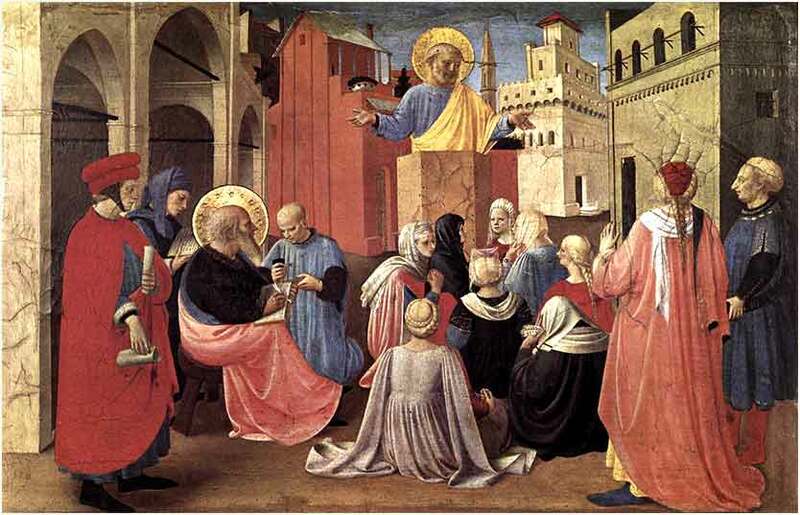 Then Peter began to speak to them: "I truly understand that God shows no partiality, but in every nation anyone who fears him and does what is right is acceptable to him. You know the message he sent to the people of Israel, preaching peace by Jesus Christ — he is Lord of all. That message spread throughout Judea, beginning in Galilee after the baptism that John announced: how God anointed Jesus of Nazareth with the Holy Spirit and with power; how he went about doing good and healing all who were oppressed by the devil, for God was with him. We are witnesses to all that he did both in Judea and in Jerusalem. They put him to death by hanging him on a tree; but God raised him on the third day and allowed him to appear, not to all the people but to us who were chosen by God as witnesses, and who ate and drank with him after he rose from the dead. He commanded us to preach to the people and to testify that he is the one ordained by God as judge of the living and the dead. All the prophets testify about him that everyone who believes in him receives forgiveness of sins through his name." Peter gave this early sermon in the Roman capital of Caesarea, after the first Gentiles had been converted. Cornelius, a centurion in a Roman legion, and several of his friends had received a vision, and Peter was called to them. After he gave this short sermon, they received the Holy Spirit. In it, Peter announces that the salvation of Christ is available to any person in any nation, who respects and obeys Christ. While Christ Himself had indicated this — for example, by His instruction of the woman at the well — it came as quite a shock to a number of Jews, including Peter himself. They have grown accustomed to believing that a personal relationship with God was restricted to Jews, as it had been under the old covenant. He reiterates this in the last sentence with the most basic message of Christianity, the "good news": Everyone who believes in Christ can receive forgiveness for his sins. Whatever ills or misery might befall us during our lives on earth, and despite the fact that we have sinned and offended God's law, our sins will be forgiven and we will come to a place of perfect peace and happiness, through the power of Christ. 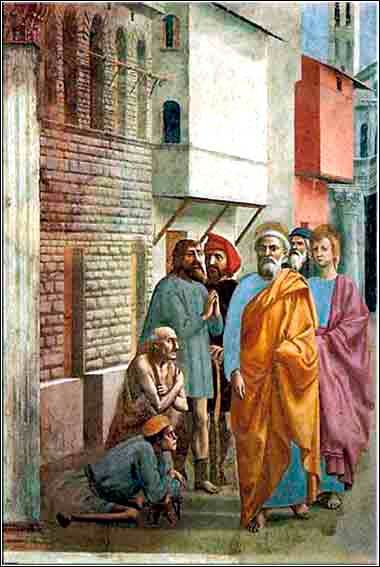 Saint Peter Healing with his Shadow by Tommaso Masaccio, 1427. 1 John 4:11-12: Beloved, if God so loved us, we also ought to love one another. No one has ever seen God; if we love one another, God abides in us and his love is perfected in us.